You will all remember my Cool Idea-Poor Execution post where I attempted to play with striping tape and a classic French. It was a failure all around. Well a lot of you gave me tips and how to deal with the tape so I got determined to not let it beat me. There was one other reason that I wanted a totally rad mani. A date with too busy guy! Can you believe it? Finally!!! Since I am writing this post after that date I will tell you that it went really great. We talked and laughed for two hours and when it was over, he asked to see me again! Some good news for a change! Want to know the funny that happened? I had done this mani on a Sunday and the date was on a Tuesday. Because of the tape lifting, which I will get to, I had added several thick layers of clear top coat to keep it from peeling off. Well imagine my embarrassment when my pinky nail popped right off at the beginning of the date! It had popped off twice at work that day and I had glued it back on twice. We had a good laugh about that-but he did like the design. 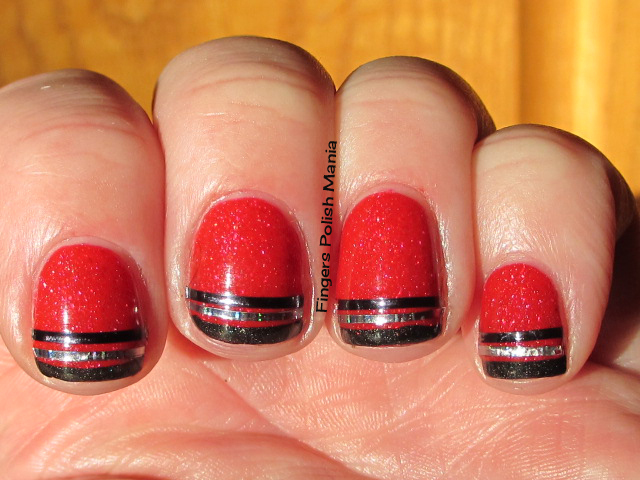 This is Picture Polish O'Hara and A England Bridal Veil with the striping tape I used. O'Hara is touted to be like Cosmos, but in red obviously. I started with O'Hara all by itself. No accent nail. Here are the starting shots. Of course, just like with Cosmos, the sun was hiding for this part. I was so determined to get this mani rockin, that I COMPLETELY forgot to take shots of each step. I promise the next mani has way too many pictures showing the steps. 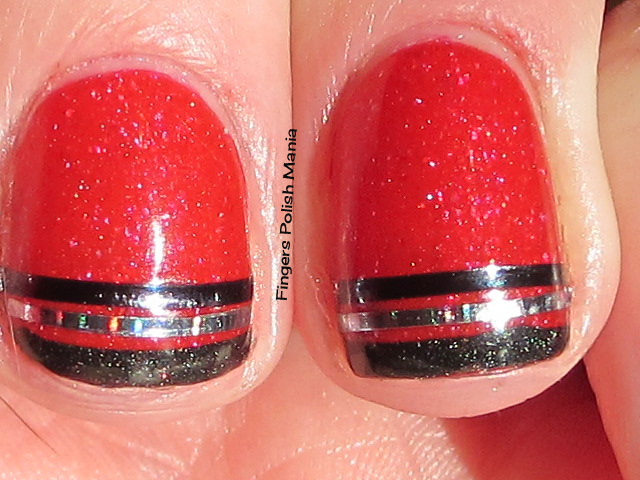 First, I placed a stripe of tape and did my funky using Bridal Veil. I then removed that tape for a straight line. Then I added another piece of black tape and a piece of holo tape. Like I mentioned before, I don't know what happened, but the ends of the tape started lifting right away. Now I had let the base color dry for an hour so I was placing the tape on dry polish. Is that what I did wrong? You guys out there who play with this tape all the time, what's the secret to getting the ends to stay down? I actually took my nipper tool and nipped off the lifted ends so it laid flat. Long story I know, but here are the awesome results. I'm pretty proud of this one for sure! How cool is this? I am in love with this look and know that I will be doing it again, but maybe painting the stripes if I can't figure out how to keep the tape down. Even with all the layers of top coat I added, there was still bumps from the tape on my nails. Stay tuned for my next masterpiece-it truly is a stunner!!! How do you deal with striping tape?